I recently ended up with way too many apples in my fridge and needed to use them quickly. I was in the mood for both apple pie and apple crisp, but I didn't have quite enough apples for both. So I decided to make a few changes and combined the two! 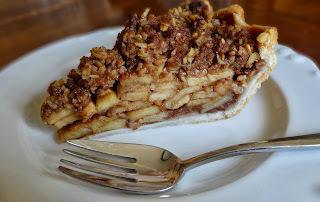 I cut way back on the spices, ditched the lattice top and used the topping for my apple crisp. I love the way it turned out! Peel and slice the apples very thin - about 1/4 inch. Soak in a bowl of cold water and lemon juice while you prep the rest of the ingredients (keeps the apples crisp and keeps them from turning brown). In a large bowl, combine the sugars, flour, and spices. Mix well and mash out any lumps caused by the brown sugar. Drain the apples and add to the sugar mixture. Toss well to coat. Preheat oven to 425. Roll out pie crust and place into the pie pan. 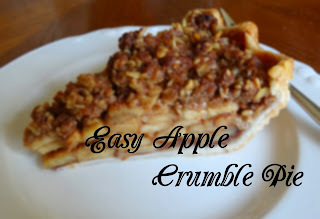 Fill crust with apples and any juice left over in the bowl. For the topping, combine the flour, brown sugar, salt, and cinnamon. Again, mash out any lumps from the brown sugar. Stir in the oats. Melt the butter and stir in until everything is combined. Set aside. Bake at 425 until the crust begins to brown - about 15 minutes. Take the pie out of the oven (yes, I know that seems like a weird step, but just trust me on this one) and sprinkle topping over the apples. Make sure any open spaces are covered - you may not use all of the topping, but any leftovers are great on ice-cream! Reduce the heat to 350 and continue baking for 30-45 minutes, until the apples are soft enough for your liking. Tent with aluminum foil if the crust or topping is getting too dark.